This is a super easy dessert and unbelievably tasty! 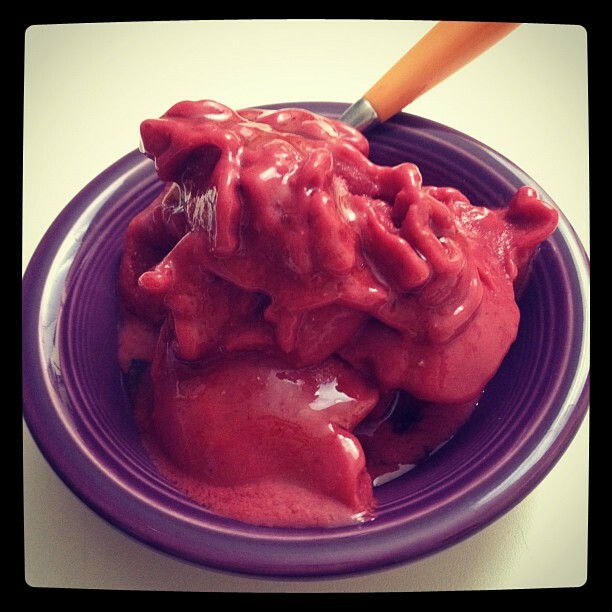 Strawberry sorbet, does refreshing even need to be mentioned? Because it is, especially if you’re in the midst of a hot weather pattern. All you need is frozen strawberries, a little almond milk, and a little sweetener of choice (I would use honey, agave, maple syrup or date paste). You could also add a dash of salt to help bring out the sweetness. Place ingredients in your high speed blender or food processor and blend until smooth like soft serve or sorbet. I filled my Blendtec twister jar up with frozen strawberries and added about a tablespoon of almond milk – enough to get it going – and probably about 1-2 tablespoons of honey. Try it first, you might not want any additional sweetener added. I find that many fruits lose their overreaching sweetness when frozen. Not sure why but sometimes it’s nice to give them a boost when they’re on their own and you’re craving a familiar dessert. This also works great with many other fruits, like bananas, mangoes, and blueberries.